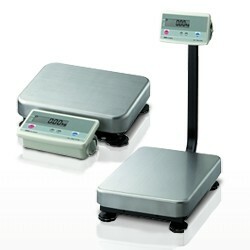 The A&D FG-K Series bench scale features fast weighing response time and accuracy suitable for any weighing application. The A&D Weighing FG-K bench scale is easy to operate and clean and also features one second response time, three weighing resolution, AC or battery operation, full scale pushbutton tare. NTEP models available - NTEP resolution indicated by an asterisk below.